Juice is really big in Dubai. Alcohol's not too common around here (it's mostly only permitted in hotels), and "mocktails" made from every imaginable combination of fresh fruit juice are the norm. This suits me just fine; other than the occasional glass or two of wine, I'm not a big drinker. Give me a Shirley Temple and I'm a happy clam. There's one juice drink that seems to be on every menu, and I quickly fell head over heels for it. It's simply called Lemon & Mint. 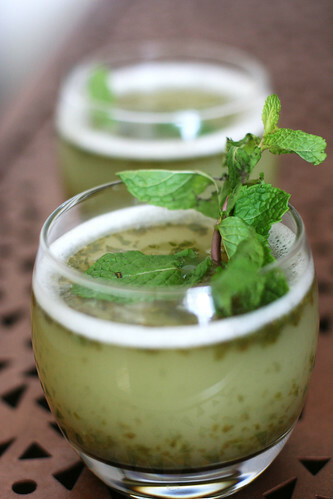 It can vary in its appearance - sometimes it looks like a green smoothie, other times more like lemonade with pieces of mint - but it always tastes sublimely refreshing with a tart kick. Feel free to adjust the quantities of ingredients to your taste, the numbers below are rough estimates of what I used. This is the kind of recipe that you'll probably need to keep tasting and modifying until you get the right proportion of sweet, tart, and minty. It should be significantly more tart than traditional American lemonade. Cheers to mocktails! 1. In a small bowl, pour boiling water over sugar and stir to dissolve. 2. In a blender (or a pitcher, if using an immersion blender), combine sugar water with remaining ingredients. Blend to desired consistency. 3. Refrigerate at least 2 hours or until chilled. Enjoy! It sounds so simple but I bet it is delicious! I will try this , we can use all the cooling drinks we can find these days ! This is such a great post, I love this drink. The locals drink it around here as well, I'm an American living in Algeria. I wish you would put a follow me gadget so I can read with you often! Sophie - I can't quite imagine it hot, it's meant to be refreshing and light. If you try it, let me know how it is, otherwise I'm sure it'll come in handy during the summer! Jennifer - if you head to your blogger.com dashboard, you can manually add blogs to follow there. Hope that helps! That sounds delicious! Definitely going to try. Ooo this looks really fun & refreshing!